After 16 years at the helm of this publication, the founding Editor of the Anesthesia Patient Safety Foundation Newsletter, John H. Eichhorn, MD, is turning over the editorial pencils and scissors (effective this issue, the 64th of the Newsletter) to his successor, Robert C. Morell, MD, who is Associate Professor of Anesthesiology at Wake Forest University in Winston-Salem, NC. There was a symbolic passing of the page-proof at the APSF Board of Directors Annual Meeting held in New Orleans prior to the ASA meeting in October. Dr. Eichhorn will remain on the Newsletter Editorial Board and will continue as an active member of the APSF Executive Committee. Dr. John Eichhorn (left) symbolically passes a page proof copy of the APSF Newsletter to incoming Editor, Dr. Robert C. Morell. After 16 years as Editor, Dr. Eichhorn will remain on the APSF Editorial Board and will continue as a member of the Executive Committee. 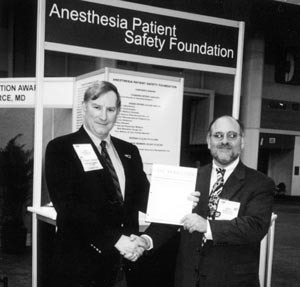 During the over a decade and a half Dr. Eichhorn was Editor, the now widely known story of the dramatic improvement in anesthesia patient safety unfolded and was chronicled quarterly in the APSF Newsletter, along with an abundance of breaking news and controversial issues. The promulgation and implementation of monitoring and other anesthesia practice standards were frequent early, then recurrent, topics. The ASA Closed Claims Study was outlined initially and then covered episodically, including in the Fall 2001 issue. The FDA equipment checkout protocol was introduced to the anesthesia community. A multitude of presentations, exhibits, and technology displays at a wide variety of meetings, as well as groundbreaking publications of many kinds, have been reported on since the earliest issues. Debates on fatigue, work hours, and provider impairment appeared periodically. Medication errors due to inconsistent drug packaging have been a recurrent theme throughout the Newsletter’s entire life. The potential huge role of sophisticated simulators in anesthesia training was first touted in these pages and also was one of many subjects reviewed as topics of grant research funded by APSF. Recently, the value of anesthesia information systems has been highlighted. Among the “breaking news” items credited to the Newsletter were CO production by carbon dioxide absorbents in certain situations, danger from succinylcholine in children, 5% lidocaine in spinals, reuse of disposables, overly aggressive liposuction, poorly organized office-based anesthesia care, and sulfites in generic propofol. Still more hot topics included a recall due to contamination of sevoflurane, post-anesthesia blindness, decrements in cognitive function, and a variety of equipment issues (such as gas pipeline), and human factors discussions (such as production and cost pressures as well as reading in the OR). “I have always thought of the APSF Newsletter as one of the most valuable things I could imagine doing,” said Dr. Eichhorn, who was educated at Princeton University and Harvard Medical School. He then began general surgery training at Beth Israel Hospital/Harvard but later switched to anesthesiology also there, a program he interrupted to be a Research Associate at the NIH. Dr. Eichhorn joined the Harvard/Beth Israel faculty in 1979, rising through the ranks there until moving to the University of Mississippi in 1991 to become Professor and Chairman of Anesthesiology at the School of Medicine and Medical Center. After early basic science research experiences, his main interests have been in the areas of anesthesia patient safety, standards, risk management, and accident analysis/error prevention, with special note for his introduction of the term “safety monitoring” in a landmark 1989 paper that first suggested improvement in anesthesia safety from the behaviors of mandatory safety monitoring. Dr. Eichhorn chaired the Harvard Anesthesia Risk Management Committee that wrote the original 1985 “Harvard standards” that became the basis for several of the standards of the American Society of Anesthesiologists (for which he chaired the Committee on Standards of Care, 1995-99) and also the standards devised by his International Task Force on Anesthesia Safety that were adopted by the World Federated Societies of Anesthesiologists at the 1992 World Congress. Dr. Eichhorn, who recently completed a 3-year term as Secretary-Treasurer of the Society of Academic Anesthesia Chairmen (SAAC), was elected in November to the position of President-Elect of that group. Dr. Eichhorn is otherwise active in multiple professional societies, widely published, and a frequent eponymous lecturer or visiting professor, and he currently is also an Alternate Director of the American Society of Anesthesiologists. Dr. Morell, who moves to the Editor’s chair from his previous role as the Associate Editor of the APSF Newsletter, received his undergraduate degree from the University of Virginia and his MD from the Medical College of Virginia. Dr. Morell’s anesthesia residency training took place at Bowman Gray School of Medicine (now known as Wake Forest University School of Medicine) where he also served as Chief Resident. He completed his fellowship training in regional anesthesia at Virginia Mason Medical Center and spent the next 3 years in private practice anesthesia in Spokane, Washington, before returning to academic anesthesia at Wake Forest in 1990. Now Associate Professor of Anesthesiology and Medical Director of the Preoperative Assessment Center, Dr. Morell began writing for the APSF Newsletter in the early 1990s, joined the Editorial Board, and soon became Associate Editor. Dr. Morell and Dr. Eichhorn have extensively collaborated over the years and co-edited the textbook Patient Safety in Anesthetic Practice, the first anesthesia textbook devoted to patient safety. Dr. Morell stated, “My close working relationship with Dr. Eichhorn lends itself to a natural and smooth editorial transition for the Newsletter.” In addition to his duties as Editor, Dr. Morell serves on the APSF Board of Directors and continues with clinical research activities directed at helping to better understand the mechanism of perioperative peripheral nerve injuries. “The quality and depth of the current APSF Editorial Board is outstanding, and an exciting future lies ahead for the Newsletter. Dr. Eichhorn’s continued presence on the Editorial Board is a tremendous asset. The support and guidance of Dr. Stoelting (APSF President) and Dr. Pierce (APSF Executive Director) have contributed tremendously to the success of the Newsletter and will help to insure the Newsletter’s continued quality, relevance, and importance to the anesthesia community,” Morell added.